NYC, 02/14/2019, 11:00AM. 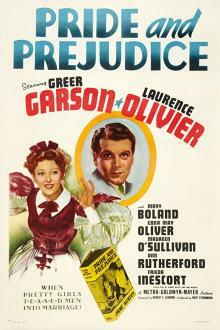 Pride & Prejudice (1940): Romance Based On Jane Austen's Famous Novel. The story of the five Bennet sisters living in early 19th century England. Their mother is scheming to make prestigious marriages for them. Focuses on Elizabeth Bennet, who mistakenly finds the rich Mr. Darcy an oaf, even as he sets all the other fair maidens' hearts aflutter. 118 min. Director: Robert Z. Leonard. Starring Greer Garson, Laurence Olivier, Mary Boland. Pride and Prejudice received an Academy Award for Best Art Direction, Black and White. The screenplay was written by Aldous Huxley and Jane Murfin, adapted specifically from the stage adaptation by Helen Jerome in addition to Jane Austen's novel.